Traders bought biotech stocks on Monday after the announcement of a large acquisition. Gilead Sciences (Nasdaq: GILD) agreed to pay $11.9 billion in cash to buy Kite Pharma (Nasdaq: KITE), about $180 a share or a premium of nearly 30% to Friday’s closing price. The deal provides Gilead with access to an emerging area of cancer treatments that are designed to train a patient’s immune cells to attack tumors. This type of personalized medicine has attracted a great deal of interest among both researchers and traders. Kite’s portfolio of potential treatments that are already in late stages of development includes a potential cure for the blood cancer lymphoma. This treatment could receive approval from the Food and Drug Administration (FDA) later this year. While Gilead was, of course, buying that treatment, they were also buying Kite’s technology. Kite specializes in developing treatments that are custom made to target a patient’s cancer. 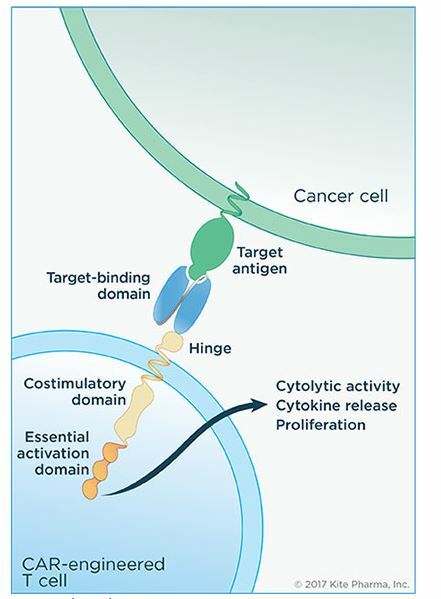 This type of treatment is called CAR-T, or Chimeric Antigen Receptor (CAR) T-Cell Therapy. CAR-T involves removing immune cells from a patients’ blood, reprogramming them to create an army of cells that can zero in on and destroy cancer cells and injecting them back into the patient. The process is shown in the diagram below. There are now almost 300 CAR-T clinical trials underway, according to experts. The enthusiasm for the research is understandable based on the early results. CAR-T clinical trials have shown huge remission rates, of up to 94% in severe forms of cancer, which is particularly impressive considering most of the trials recruit patients that have not responded to all other available treatments for their form of cancer. These preliminary results have led to high expectations among patients, researchers and investors. But, there is no guarantee the results will lead to breakthroughs. But, there are risks. In clinical trials, CAR-T cells have been linked to severe side-effects, such as neurotoxicity and cytokine release syndrome. The recent report of several deaths in CAR-T trials made many realize that the technology might not be as perfect as they had originally expected. The risks are there, but Gilead is faced with a shrinking market and billions of dollars in cash on its balance sheet. Gilead has developed the top selling treatments for HIV and for the liver destroying hepatitis C virus. It’s drugs are life savers, but they are expensive. Two of the company’s drugs, Sovaldi and Harvoni, cure hepatitis. Reports indicate a success rate is 94% to 99%. This is good news for patients, but it shrinks the market for the company’s drugs. To offset the reduced market potential, Gilead charges high prices. Sovaldi costs $84,000 and Harvoni costs $94,500 for a complete course of treatment. The high prices are partly justified by the alternative. In the worst case, patients could require a liver transplant costing more than $500,000. Even though the drugs are high priced, they are sold at a discount to large customers like insurance companies and the Department of Veterans Affairs. Discounts could be 50% or more, reducing the cost significantly. GILD also sells high priced HIV drugs. These drugs, which patients are often required to take for life, can cost $30,000 t0 $42,000 a year although, again, discounts are offered to large buyers including government insurance programs. These drugs have allowed to Gilead to develop a strong balance sheet. In the past twelve months, sales topped $28 billion and earnings totaled more than $12 billion. Strong cash flow has helped the company accumulate more than $20 billion in cash and cash equivalents. The results of introducing a new drug and shrinking the market for the drug can be seen in the stock price of Gilead. The long term chart below shows the large rally, subsequent sell off and recent trading range in the stock price. Kite provided a way for the company to use some cash and enter a new market. Gilead is now a leader in the CAR-T field and will benefit from developments in the field while carrying risks. Kite Pharma has already reported results from a Phase II clinical trial with its lead drug candidate, axicabtagene ciloleucel. The therapy managed to keep 36% of patients with lymphoma clear of the disease after 6 months. However, this ongoing trial has already reported three deaths, two of them linked to the CAR-T therapy. The company has already filed an FDA application for approval of the drug and is expecting a final decision in November. The deal led to large moves in the stocks. Kite moved up to the announced acquisition price. This is normal in a deal. It indicates traders expect the deal to close as announced. If Kite moved above the announced price that would indicate a bidding war is expected. That’s not the case with this news. Gilead also moved higher on the news, although the price advanced just a few percent. This is a positive development for the company. The rally indicates traders see potential up sides in the deal and are pleased to see the company addressing the problem of holding too much cash as sales decline. Often, when a deal is announced, we see the acquiring company decline in price. This happens because traders recognize there are risks associated with integrating the new company. Those risks could reduce operating profits and require management attention. Integrating a new company into operations can often distract management from other activities in the short run. That means new product decisions could be delayed and other potential deals may not be possible. It generally takes time to judge whether a deal is successful. Because it will take time to determine the success of the deal, in the short run it is likely that Gilead will pull back, at least slightly. The next rally in the stock could come when news related to the approval of axicabtagene ciloleucel is announced. Given the limited upside potential for Gilead in the short term, traders can consider opening a short term bear put spread. This trade involves buying one put option to benefit from the expected decline in the underlying stock and selling a second put option with the same expiration, but with a lower exercise price, to offset the cost of the trade. The risks and rewards of the strategy are shown in the diagram below. To implement this strategy in Gilead, options expiring on September 1 can be used. The September 1 $75.50 put can be bought for about $0.48. The September 1 $73.50 put can be sold for about $0.18. This trade will cost about $0.30 to open, or $30 since each contract covers 100 shares. The maximum possible loss on the trade is equal to the premium paid to open the trade, or $30 in this case. The maximum possible gain on the trade is equal to the difference in the exercise prices of the options less the premium paid to open the trade. 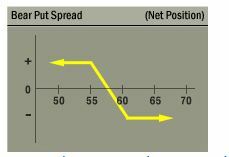 For this position, the maximum possible gain is equal to $170, more than 5 times the amount of money risked in the trade. This is a large potential gain for a relatively small amount of risk. If GILD ends the week between the exercise prices of the options, the gain or loss will be less than the maximum. However, the potential returns, on a percentage basis, are significant and the risk can never equal more than the amount paid to open the trade.